The SIOP PODC has been quite active since the SIOP Annual Conference in Cape Town, South Africa. Our 10 current working groups include: Abandonment of Treatment, Adapted Treatment Regimens, Education and Training, Essential Drugs, ICCCPO and Parent Support Groups, Nutrition, Nursing, Palliative Care, Supportive Care, Twinning, Collaboration and Support. We have four Task Forces: the SIOP Africa/PODC Collaborative Wilms Tumour Project, The Hospital Detention Task Force, the Psychosocial Task Force and the Integrative Medicine Collaborative. 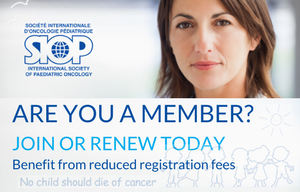 Currently, there are 195 members on the SIOP PODC group on cure4kids and 44 countries are represented. The SIOP PODC co-chairs, Ramandeep Arora and Julia Challinor have been working with the SIOP Board to streamline PODC-relevant information and opportunities within the SIOP Congress Handbook. Members of PODC will be solicited to nominate themselves for a position on the Scientific Programme Advisory Committee (SPAC), which helps create the scientific program of the annual meeting and reviews submitted abstracts. We think this will provide expertise that is needed as more and more abstracts are submitted from low- and middle-income professionals. We are also actively looking for financial support for LMIC co-chairs of SIOP PODC to be able to attend the annual Congress. 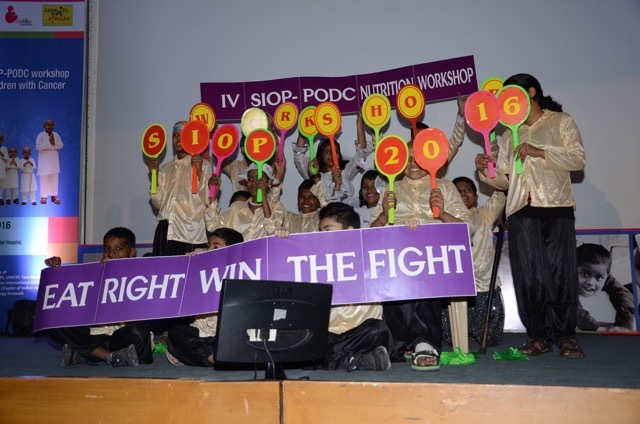 The “Second International SIOP-PODC workshop on Nutrition in Children with Cancer” was held recently on 6-7th February, 2016 at Tata Memorial Hospital in Mumbai, India with additional support from CanKids-Kidscan, & Cuddles Foundation. The meeting was attended by 229 participants from more than 60 centres in India. A total of 43 nutritionists from 32 centres in India participated in the fellowship training as well. In addition, a special issue of Indian Journal of Cancer was released with manuscripts by faculty, Indian centres’ data on more than 6000 children, and an editorial on impact of India capacity building model across the globe. SIOP-PODC facilitated the formation of a national group for childhood cancer nutrition composed of 8 organisations and more than 50 members called “POSHAN” (Pediatric Oncology Stakeholders for Holistic Assistance in Nutrition), which also means “nutrition” in Hindi, with the objective of systematically and collectively working on nutrition in children with cancer across all stakeholders, and collaboratively with other organizations in India. The SIOP PODC Hospital Detention Task Force has recently published a position statement in Lancet Oncology (Aug 2015), “Hospital Detention Practices: Statement of a Global Taskforce”. A survey is being designed to determine physician perspectives and global networking is on going to generate awareness and impact of detention. The SIOP PODC Essential Drugs Working Group had a successful meeting on Day -1 at the Annual Congress in Cape Town. Stakeholders from multiple categories attended the meeting to address the lack of access and quality control for chemotherapy and supportive medication in most LMIC. The working group is exploring opportunities with WHO/UICC/ASCO/NCI/CCI/WCC etc. on production/drug quality/affordability/and accessibility led by working group members and striving to create a global coalition. A publication on drug shortages and prices was written by Ronnie Barr and Jane Robertson, “Medicines for Cancers in Children: The WHO Model for Selection of Essential Medicines” Pediatr Blood Cancer 2015 (DOI 10.1002/pbc.25564). Finally, SIOP PODC and CCI are collaborating in Dublin for the annual Congress on a Global Stakeholder Village symposium on Day +3 (October 22). The focus of this symposium will be to bring together international NGOs, professional groups, and health professionals working in LMIC on service delivery models, cancer registries and palliative care. The afternoon of the same day will have a full 3-hour “Workshop on Ethical Dilemmas and Moral Distress in Global Pediatric Oncology” led by a team from Texas Children’s Hospital. Julia Challinor, co-chair is now working with the SIOP Advocacy Task Force, which is striving (together with Childhood Cancer International [CCI]) to gain WHO recognition. This is a years-long process, however, current activities include the formation of a WHO Steering Committee and several planned workshops on childhood cancer in Ghana (completed), Ethiopia, Myanmar, Kazakhstan and Fiji. Members of SIOP PODC and CCI are involved in all the workshop preparations in collaboration with WHO local representatives. Future plans include the updating of the SIOP PODC website and creation of impact measures to determine if the PODC working groups are making a difference in LMIC and if so, what specific areas of improvement can be documented and tracked. We look forward to SIOP 2016 in Dublin, Ireland. 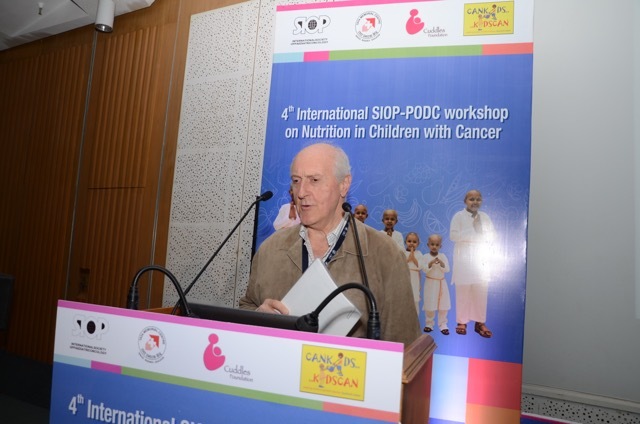 International SIOP-PODC Nutrition workshops:The ‘First International SIOP-PODC workshop on Nutrition in Children with Cancer’ was held in Mumbai, India on September 27-28, 2014. Meeting provided training to 255 participants from approximately 100 centres across India. The second workshop was conducted during SIOP-Asia meeting at Amman, Jordan on 24th April, 2015 which was attended by 154 participants from Jordan and surrounding countries. This was followed by third workshop at Sao Paulo, Brazil in November, 2015 attended by 102 participants. The 4th workshop was held recently on 6-7th February, 2016 at Mumbai. The meeting was attended by 229 participants from more than 60 centres in India as well as Bangladesh and Ethiopia. Overall, these 4 highly successful workshops provided nutritional education to more than 700 health care providers. The group plan to continue this momentum by conducting workshops during SIOP-Asia 2016 at Moscow and in Bangkok in 2017. The group is also establishing metrics to measure the effectiveness of these workshops on advancing clinical care and nutrition research agenda. SIOP-PODC Nutrition fellowships: Prior to the SIOP-PODC workshop in 2014 there were virtually no training fellowships for nutritionists to get formal training in pediatric nutrition or specialized training in pediatric oncology in India. With SIOP-PODC efforts, the first post-graduate course in pediatric nutrition has been started by Sir Vithaldas Thackersey College of Home Science, Mumbai. Through this program, students undergo one to two months of training in pediatric oncology at Tata Memorial Hospital, Mumbai after completing basic pediatric training. Further, Tata Memorial Hospital with SIOP-PODC has been able to initiate SIOP-PODC onco-nutrition fellowships in pediatric oncology. The first such fellowship program trained 24 students from ten centres in India in April 2015. 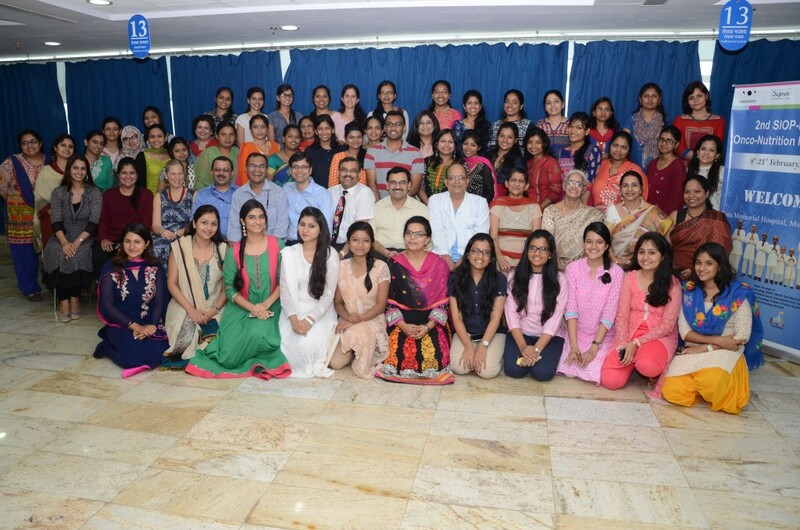 The 2nd fellowship in February, 2016 provided training to 43 nutritionists from 32 centres in India. SIOP-PODC group is planning to expand these efforts by starting a similar Onco-nutrition fellowship in collaboration with King Hussain Cancer Centre, at Amman, Jordan . Formation of Indian National Nutrition group: SIOP-PODC facilitated the formation of a national group for childhood cancer nutrition in India composed of 8 organisations and more than 50 members called “POSHAN” (Pediatric Oncology Stakeholders for Holistic Assistance in Nutrition), which also means “nutrition” in Hindi, with the objective of systematically and collectively working on nutrition in children with cancer across all stakeholders, and collaboratively with other organizations in India. The overarching goal of “POSHAN” is to train or support the salary of dieticians covering 100 key centres in India by 2018 so that there is at least one trained nutritionist for every 250 children with cancer. Currently, 42 centres have a trained nutritionist as a result of these efforts. 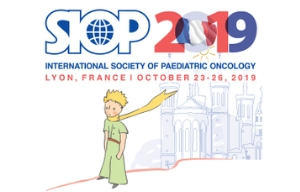 Development of Nutrition Research Capacity: SIOP-PODC through its workshops has attempted to provide a forum for sharing, collaboration, training and mentorship in conduct of nutrition research in pediatric oncology in each region. In India, it led to presentation and publication of a special series of research articles published in a special issue of Indian Journal of Cancer with data on more than 6000 children and survivors and an editorial on impact of India capacity building model across the globe. In Brazil, this effort established collaboration with the National Cancer Institute of Brazil, Sociedade Brasileira de Oncologia Pediatrica (SOBOPE), and the SIOP-PODC. A regional plan that includes the combined effort and collaboration of these established entities in Brazil is underway. In conclusion, the SIOP-PODC Nutrition Working Group has been successful in providing education to a large number of pediatric oncology clinicians, establishing training programs, advancing the documentation of local standards and burden of malnutrition, and cultivating a local research agenda in nutrition. Importantly, this effort has stimulated interest and dedication from key stakeholders to form a local alliance in India to maintain momentum and continue to build local capacity in the future. With this foundation in place, the SIOP-PODC Nutrition Working Group aims to expand this model to other parts of Asia, Africa and Latin America in coming years.